We arrived at the Car Park in Ystradfellte shortly after 9.45 a.m. and as there was no charge for using the village car park it immediately had Mick’s seal of approval. As regular Brilwalks Website visitors will know Mick is very unhappy about paying car-parking charges! Although I had a map of the area with me, and had done a little bit of homework on our route, Larry was to do the navigating, and he generally made a good job of it. However, initially he led Mick the wrong way out of the village! The reason for this? Larry's walk details started from a different car park, which was about a mile away. However with a bit of map reading we were soon walking in the right direction. The correct exit from the village was to leave the car park and go south-east passing the village toilets on the way - a bit primitive but very welcome after 2 hours travelling. It was then over the river bridge, uphill and within about a quarter of a mile we left the road and took a right of way on the right. 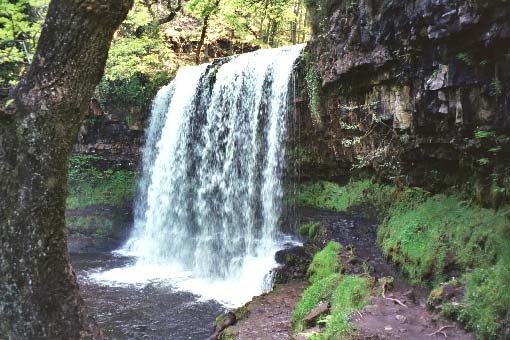 This eventually led to another car park (Porth yr ogof) – not a free one – and the start of the walk proper. 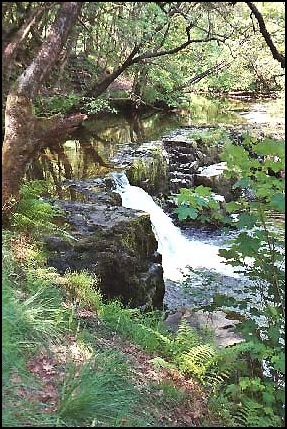 Having walked to the vehicle entrance to the car park, we crossed the road and took the path ahead that went slightly left and gradually became very rocky, with boulders and potholes in evidence, before we reached a grassy area by the River Mellte. From here the navigation was easy. 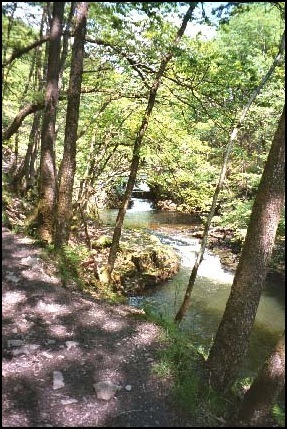 Although the path was quite undulating all we had to do was keep the river on our right as we accompanied it downstream. 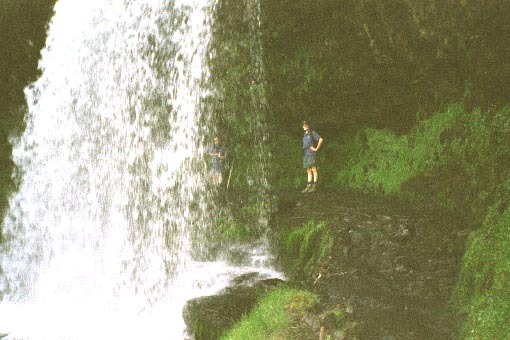 It seemed no time at all before we could see below us the Sgwd Clun-Gwyn Falls. 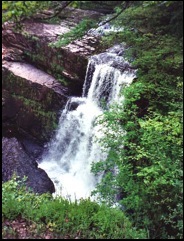 These were the first major waterfalls of the day and very spectacular they were too. Needless to say photos were taken but like so many views you see on walks it is rare that a photo, particularly if I am behind the camera, can do justice to the scene. At this point we debated which way to go. We could have gone south-east through the woods and away from the river or the more interesting, and at times quite exposed, path that followed the river gorge. We took the latter. Although the weather had been fine for quite a few days this path was still quite muddy and slippy and so we took great care as we traversed this slightly worrying route. I suppose on reflection the path was not that dangerous, but as Mick stated "you wouldn’t want to risk your wife along it". See he does care about you Chris! You would only have had to veer a few inches to the right to find yourself taking a shortcut to the river below. Therefore care was important. 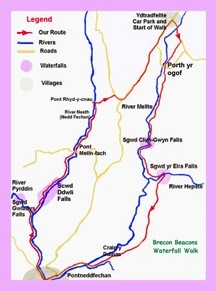 I think we were all happy when the path ascended - somewhere above the Mellte’s confluence with the Afon Hepste – to a less precarious track, which, within a quarter of a mile or so, brought us to a convergence of a number of paths. 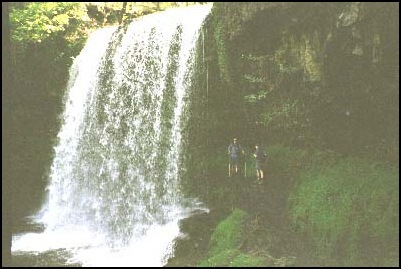 The track we wanted was signposted to what we all considered to be the high spot of the day, the beautiful waterfall called Sgwd yr Eira. However, to get there we needed to descend into the gorge below via over 200 steps and so I was pleased to have my walking poles with me as parts of this downhill route were very treacherous. 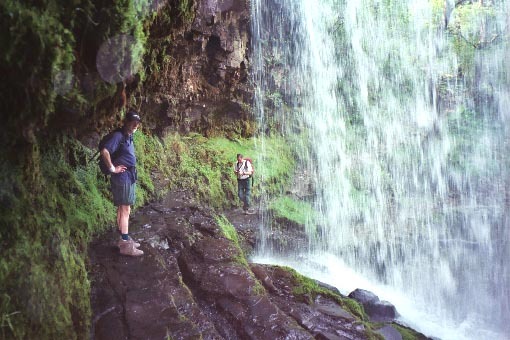 This waterfall, which in English is called the "Spout of Snow", is a curtain of water which drops about 8 metres and behind it is a path, which allows walkers to get to the other side of the river. I thought it a wonderful experience. The noise and the spray were almost magical. I could have lingered there a long time. It really was enjoyable. Needless to say it was with great regret that I left as having descended into this river gorge we now had to climb out of it. I didn’t count the steps this time but certainly I knew I’d walked up a few when I finally got to the top and rested with Larry and Mick before we started the next stage of our walk. 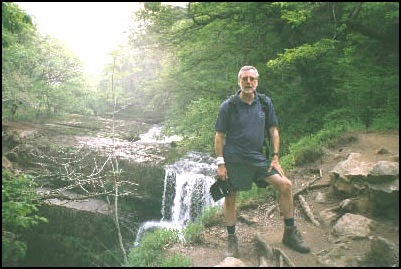 This took us over open moorland and through mixed woodland before, having passed some climbers on the rocky slopes of Craig y Ddinas, we reached the small village of Pontneddfechan. By the time we reached the village, which was about halfway through our walk, we were hot. We were tempted to visit one of the two hostelries we noticed in the village – the Angel looked particularly inviting. However, we were a little behind schedule, and alcohol would invariably impact on our afternoon speed. So we visited the village Post Office/General Store where we purchased frozen raspberry drinks, which we licked and sucked accompanied by our lunchtime sandwiches. The "drinks" certainly were frozen; it was almost an hour later when I finished licking/drinking mine. 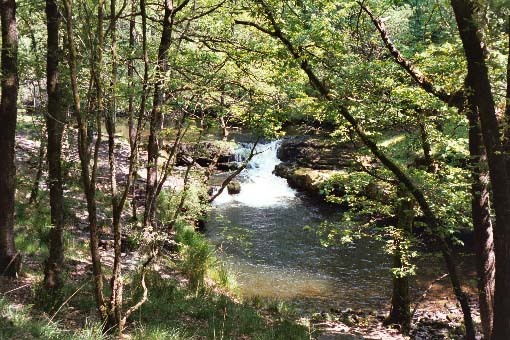 The next part of our walk took us up the old tramway path, which was located to the right of the Angel on the left (west) bank of the River Neath, or the Afon Nedd to give it its local name. This was a very pleasant part of our walk. Although we were following the river upstream the path was comparatively flat. 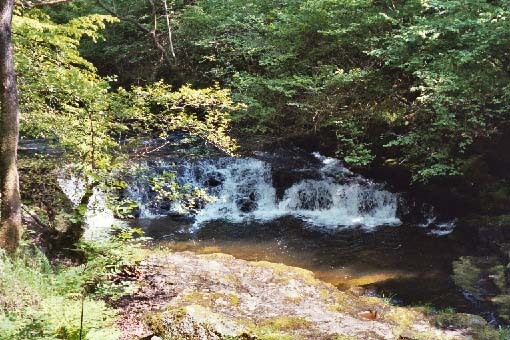 We were shaded from the hot rays of the sun by the broadleaf woodland canopy and to our right the river’s noise added enjoyment to our northward stroll. 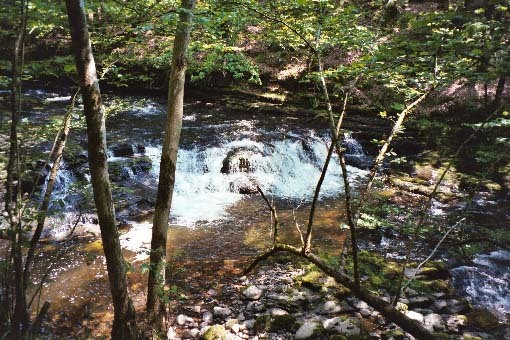 After about a mile we came to the confluence of the Neath and the Afon Pyrddin and the bridge we would later use to cross the river so we could continue our walk upstream along the west bank of the Neath. 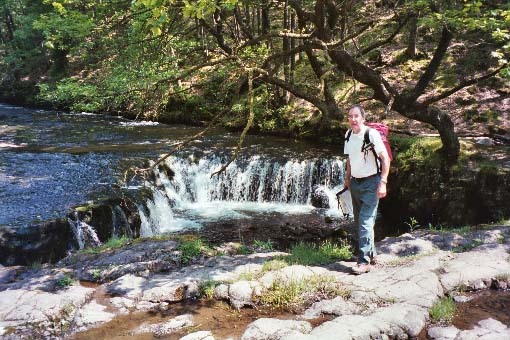 However, before crossing the river we followed the Afon Pyrddin to what we thought were the Sgwd Gwladys waterfalls. I thought these were not as impressive as some we had seen earlier in the day. 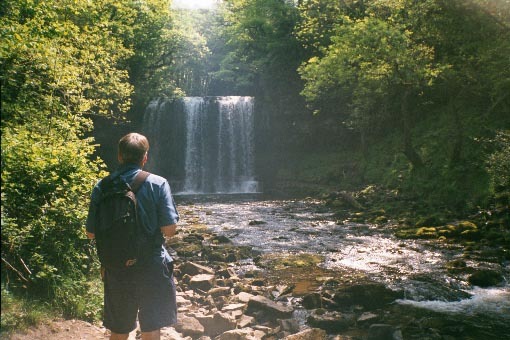 However, it was not until I arrived home and looked in a walking book that I realised these falls should have been some 7 or 8 metres high and possible to walk behind like the Sgwd yr Eira Falls. Damn it. In our rush to make up time we had missed the spectacle of these falls. Looks like a return trip will be necessary! 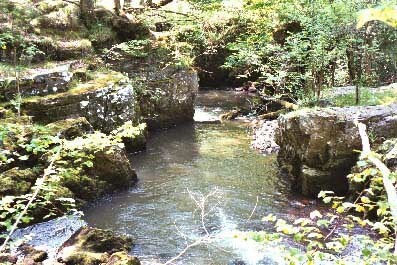 Having retraced our steps, we crossed the bridge and, ignoring the similar bridge on our right, resumed following the River Neath up stream. This path was far more difficult than the "tramway" and, yet again, I was pleased that I had my walking poles to help with the undulations and the mud we encountered along the way. 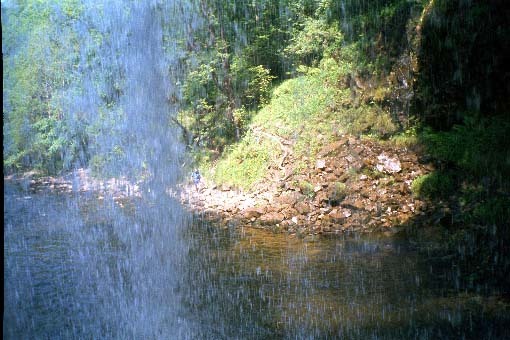 Soon we reached beautiful waterfalls called Sgwd Ddwli. 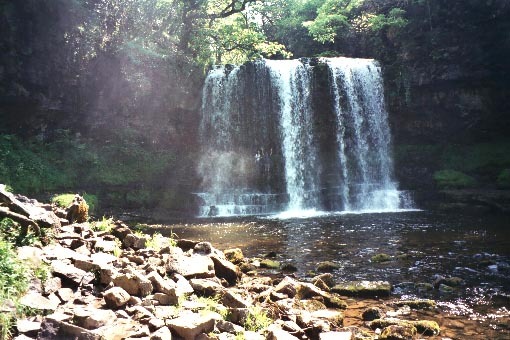 Unlike the Sgwd yr Eira these falls are a succession of smaller watershutes and I’m pleased to say we did linger to enjoy these and take photographs. Needless to say I was the last of our trio to reach the road bridge at Pont Melin Fach. The views, as far as I was concerned, were too spectacular to rush. However, like Larry and Mick, I did rush the next part. 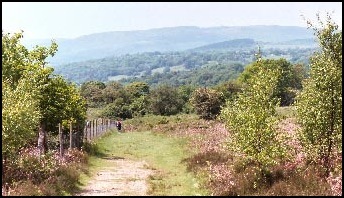 We crossed over the bridge, turned left over a stile and took the higher of the two paths (the one on the right). 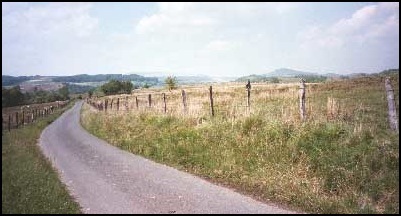 This we followed, for the most part high above the Neath, until we said goodbye to it when we reached the bridge at Pont Rhyd-y-cnau. At the bridge we turned right (east) and followed a very steep track to a minor road, located at the top of this ascent. We were pleased to reach the top not only to have the climb behind us but also to enjoy the cool breeze that was blowing. It was also pleasant to appreciate the openness of the hilltops having spent most of the day in the wooded gorges of this landscape. It was then right along the minor road, left at the next road junction and 30 minutes later we were back at the car park in Ystradfellte. It had been a great day’s walking. 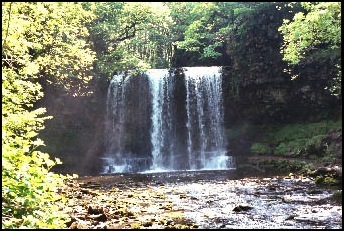 I really enjoyed the waterfalls, particularly the Sgwd yr Eira. 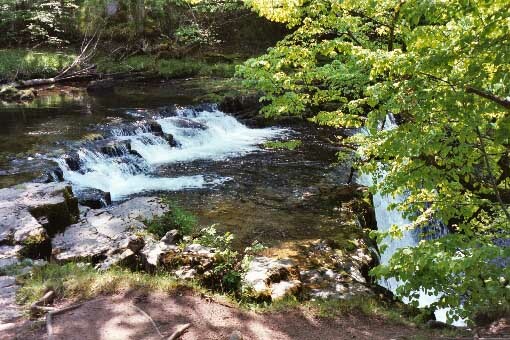 However, it was a pity that other commitments did not give us enough time to fully appreciate the beauty of this ramble. We did about 11 miles and it had taken just over 5 ½ hours. In writing these pages I have found that many Welsh place names have different spellings. Apologies in advance if you should find that I have not been consistent in the spellings of place names referred to. The map used for this walk was the O.S. Outdoor Leisure Map No. 11 for the Brecon Beacons.